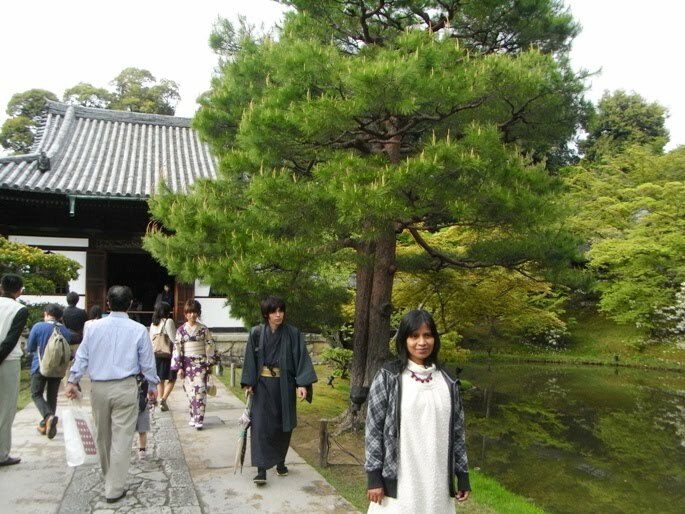 As I wrote in the previous post, on the afternoon of 1st May hubby and I visited Yasaka Jinja Shrine in Kyoto. 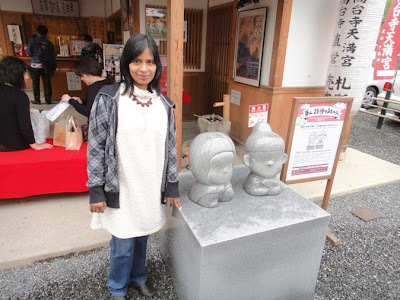 Later we visited Kodaiji Temple about which I will write in this post. Kodaiji Temple, formally known as Jubuzan Kodaijushozenji Temple, is located in Higashiyama Mountains of eastern Kyoto just south of Yasaka Jinja. The temple belongs to Kenninji School of Rinzai sect of Zen Buddhism. 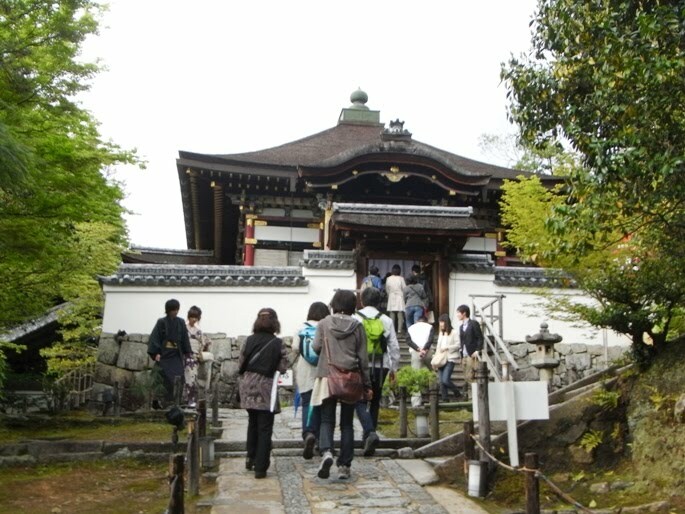 The temple was established in 1606 by Kita-no-Mandokoro (also known as Nene) in memory of her late husband, Toyotomi Hideyoshi. 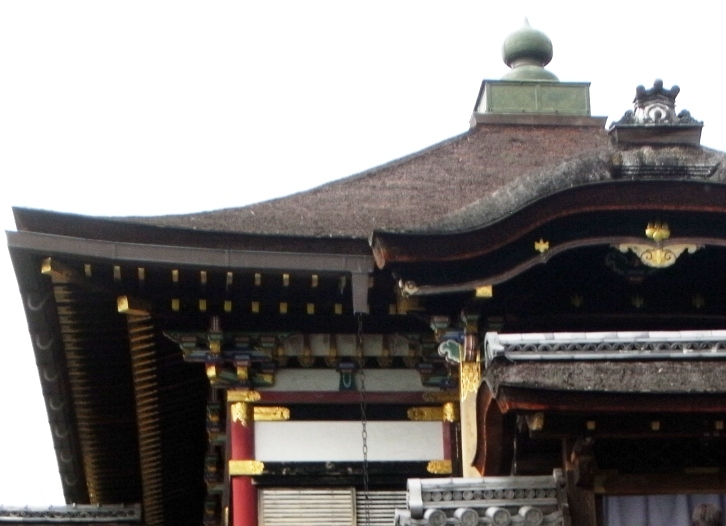 The construction of the temple was extensively financed by Tokugawa Ieyasu, the first Shogun of Tokugawa Shogunate. 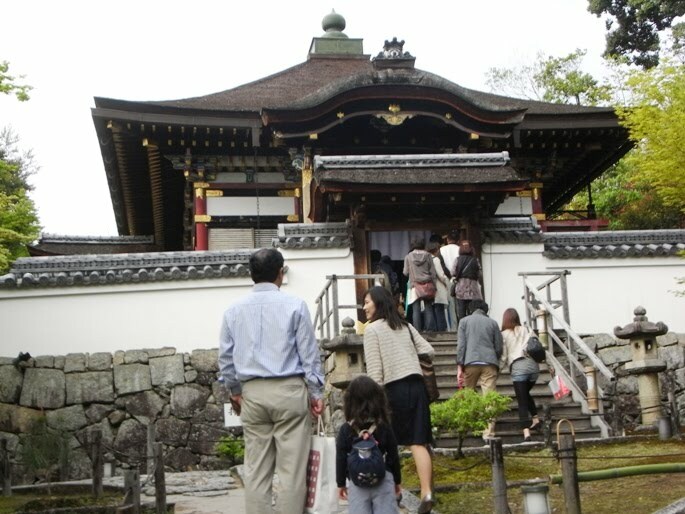 The name of the temple is derived from the word ‘Kodaiin’, which was the honorary name accorded to Nene by Emperor Goyozei in 1603. Nene died at the age of 76 in 1624. 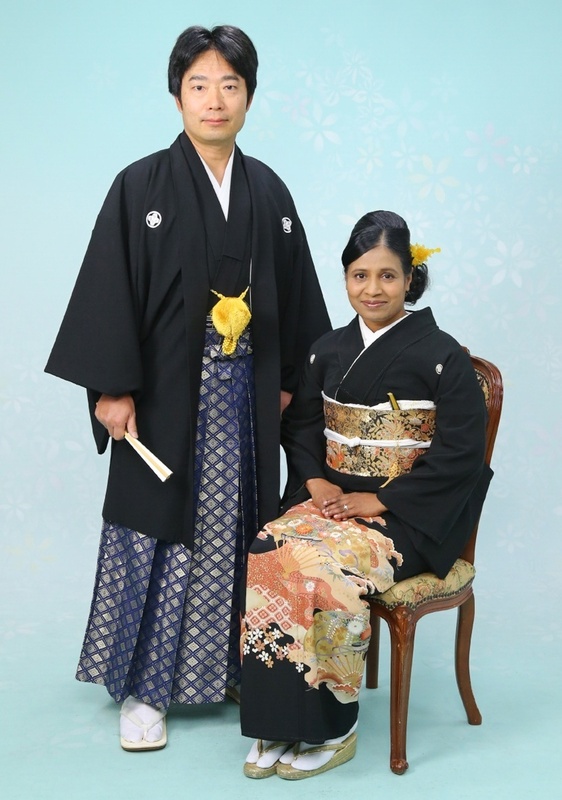 The same year, Sanko Joeki, the abbot of Kenninji Temple, was appointed the founding priest of Kodaiji Temple. 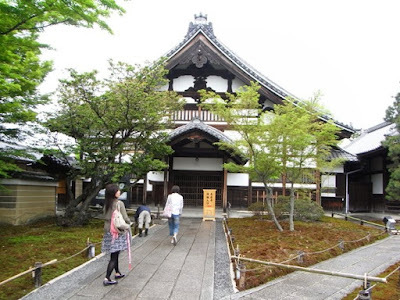 Since then Kodaiji Temple has been one of the largest and most important sub-temples of Kenninji Temple. At the time of the establishment of Kodaiji Temple, it was known for its splendor, beautiful design, and exquisite craftsmanship. However the temple was destroyed by a series of fires after 1789. The buildings named Otamaya, Kaisando, Kangetsudai, Kasatei, and Shiguretei are the only original structures of the temple that have survived, and all these have been designated as important cultural properties of Japan. Kodaiji Temple is located just 600 meters southeast of Yasaka Jinja but as we took a leisurely stroll through the narrow streets, it took us almost 30 minutes reach the temple area. We walked on a very narrow road named Nene-no-Michi that led to Daidokorozaka stone steps. 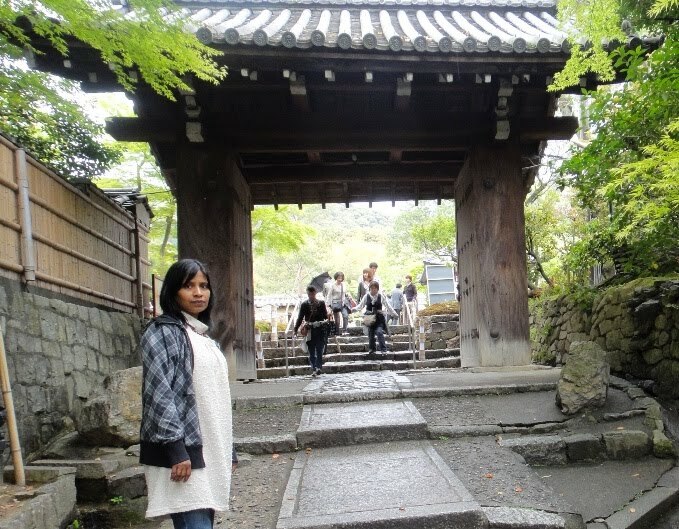 After climbing these steps we reached the entrance gate of Kodaiji Temple. Just after entering the entrance gate, we saw a building named Kuri to our left which is visible from outside the paid area of the temple precincts. The building has an interesting structure and is the living quarters of the priests. At a ticket booth located west of Kuri building, we purchased tickets worth 600 Yen per person as admission fee and entered inside the temple precincts. 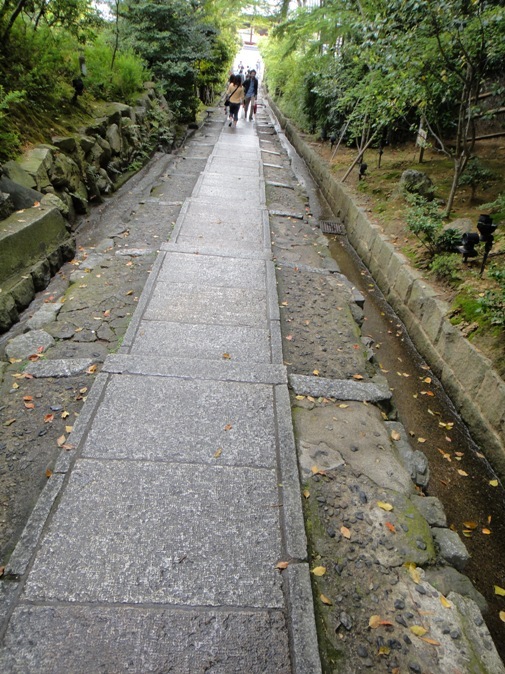 We walked on a paved pathway inside the temple precincts. 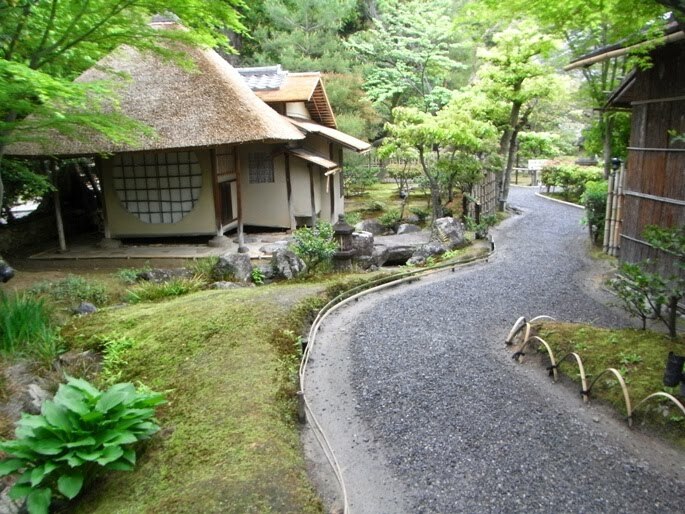 To our left, in the northern area, we saw a beautiful and elegant looking tea ceremony room named Iho-an. It is also known as the cottage of lingering fragrance and has a unique large round window. 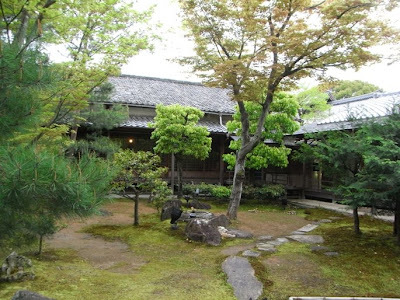 Iho-an was the favorite tea ceremony room of Haiya Shoeki, a wealthy merchant, and Yoshino-dayu, a renowned beauty and dancer who later became Shoeki’s wife. After passing Iho-an, we started walking towards the south on the paved pathway. 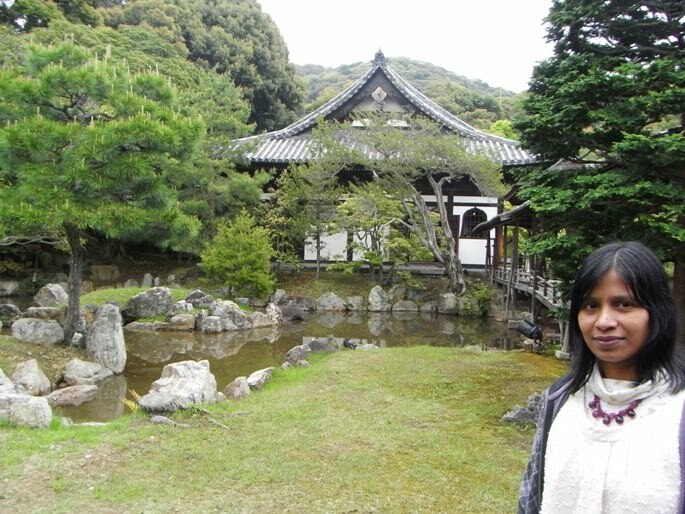 Here, to our right, we saw two teahouses named Onigawaraseki and Kogetsu-an along with a beautiful garden. 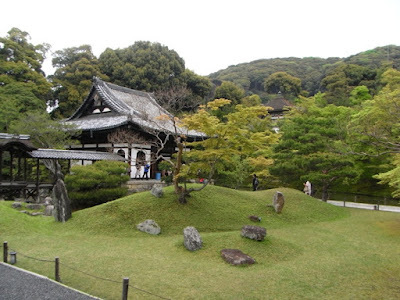 These teahouses represent the tea ceremony architecture of this temple. While continuing our walk towards the south on the paved pathway, we saw Hojo Main Hall located to our right. The interior of the building was originally painted with lacquer and covered with exquisite gold decorations. The current building was rebuilt in a modest style in 1912 after the original burned down in a fire. The principal image inside the hall is a statue of Shaka Nyorai. We entered the main building and prayed. Unfortunately I do not have a photo of the building. 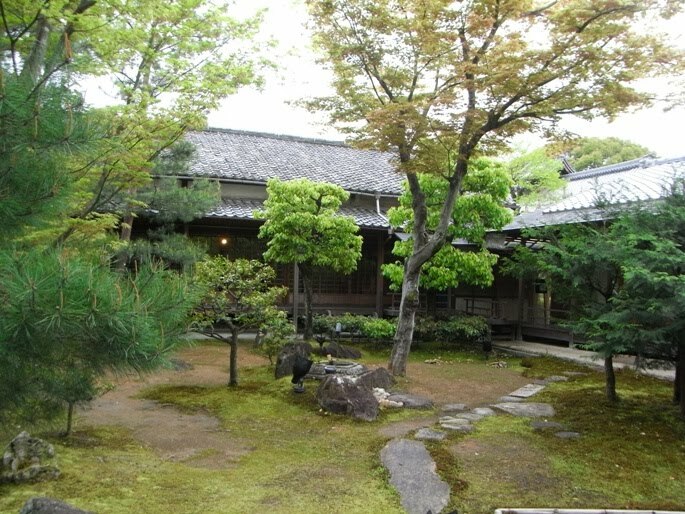 Hojo Main Hall is surrounded on two sides by impressive gardens designed by leading contemporary masters. 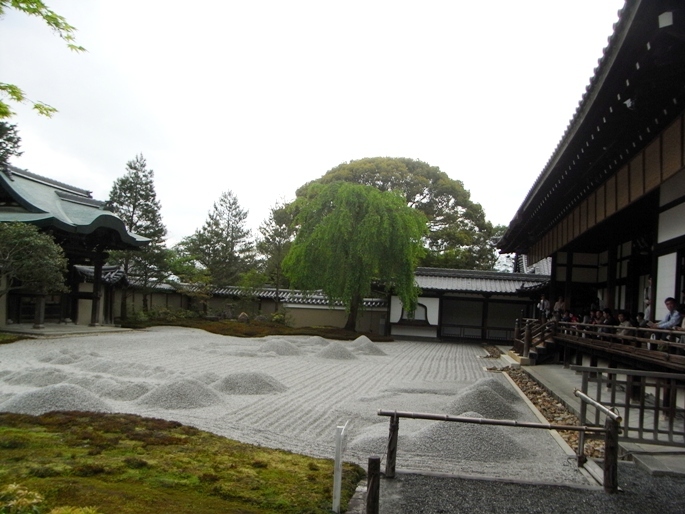 The south-garden named karesansui is a dry rock garden located to the south in front of Hojo Hall. It is a relatively recent creation that features a large field of raked gravel punctuated by conical gravel formations, and is surrounded by an undulating border of moss and stone. The raked gravel of a karesansui is meant to evoke the ripple patterns that form in water. 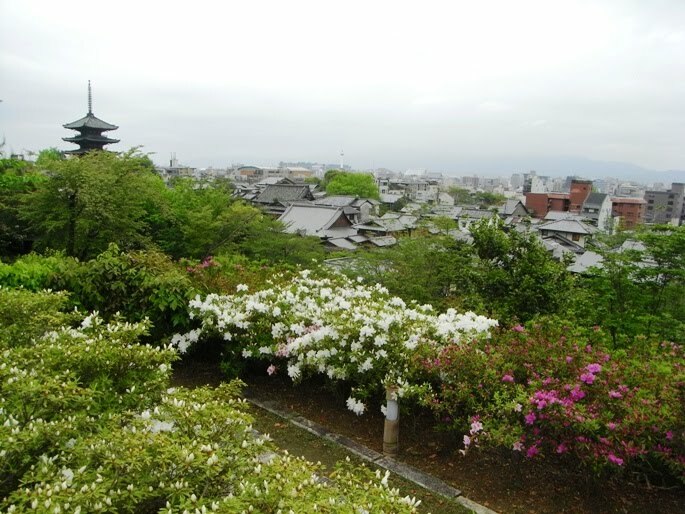 We sat on the southern side verandah of Hojo Hall and enjoyed viewing this garden for some time. 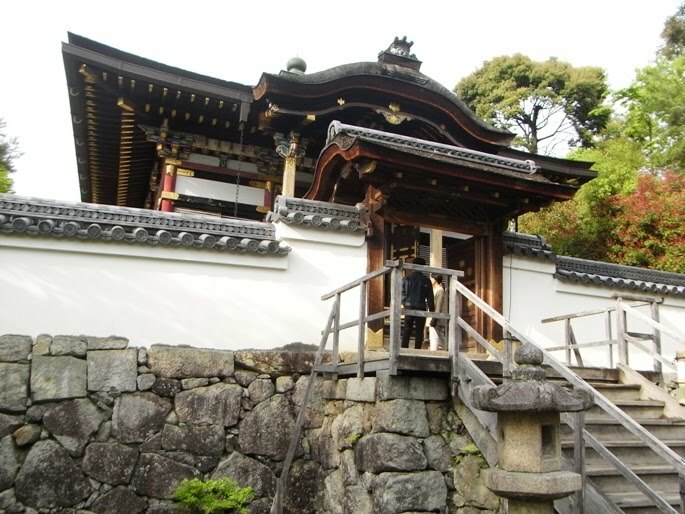 Chokushimon, an outer gate to the temple complex, stands proudly behind the rock garden. In the foreground there is a cherry blossom tree which was so green and lively. Rock garden as viewed from the eastern side of Hojo Hall. Visitors are enjoying the garden view sitting on the southern side verandah of the hall. 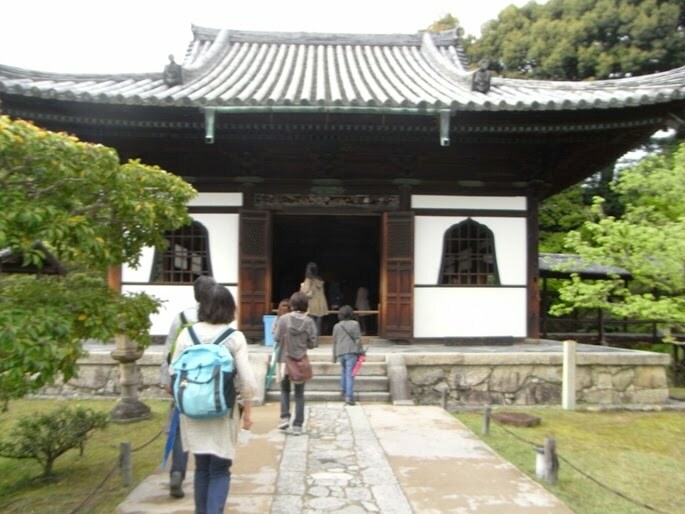 Next, we walked towards the eastern side verandah of Hojo Hall. From here we got a wonderful view of the north-garden of the temple. 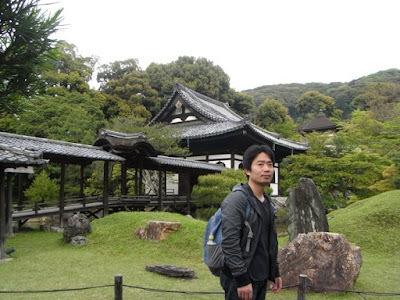 This garden was redesigned by a renowned landscape architect Kobori Enshu from an older garden located on this site. Famous for its excellent stone layout, it is one of the finest gardens of its period. 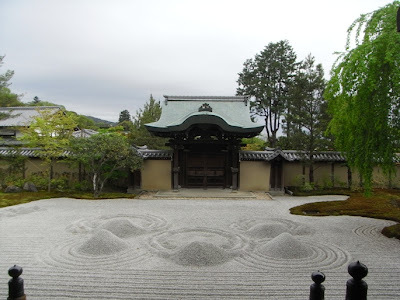 It is an impressive Tsukiyama style garden featuring a pond, manmade hills, decorative rocks, and beautiful pine and maple trees. 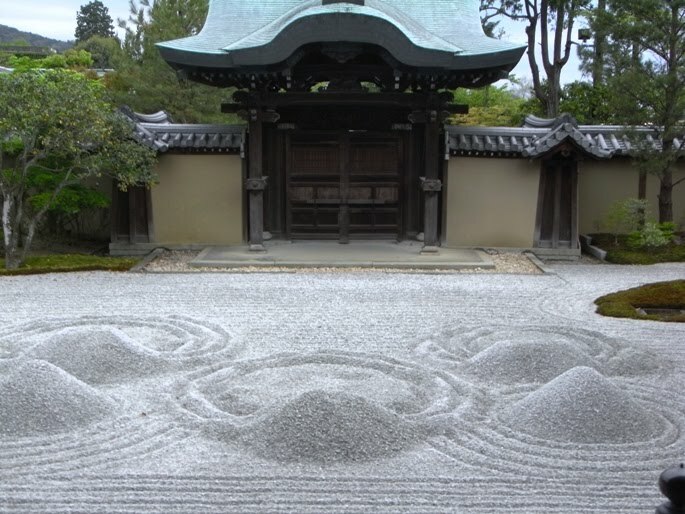 In the north section of the pond is an island in the form of a turtle, and in the south section is a group of stones representing a crane. This garden has been designated as a place of historical importance and outstanding scenery. Within this north-garden stands a remarkable building named Kaisando Founder’s Hall. We enjoyed the view very much and took several photos of the garden and Kaisando Hall from the verandah of Hojo Hall. I am standing in front of Engetsuchi Pond with Kaisando Hall in the background. 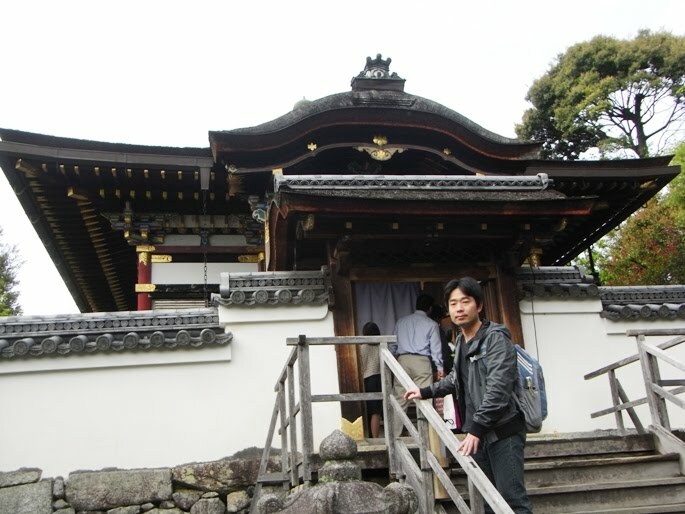 This photo was taken when I was standing adjacent to a building named Shoin. 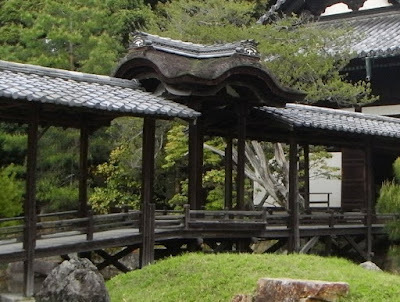 From the verandah of Hojo Hall, we saw another structure named Kangetsudai which is located to the northeast of the hall. Kangetsudai is a small four pillared pavilion structure designed to allow viewing of the reflection of the moon on the surface of the pond named Engetsuchi. The architectural style of the pavilion is special as it has Chinese style cypress bark roof with three gables. The pavilion is located on a bridge that connects a building named Shoin Reception Hall to Kaisando Hall. The pavilion is an important cultural property. Afterwards we left Hojo Hall and visited Kaisando Founder’s Hall which is located to the northeast of Hojo Hall. Kaisando Hall is dedicated to the memory of the founding priest of Kodaiji Temple, Sanko Joeki, who was also the 195th abbot of Kenninji Temple. His statue is located on a platform in the innermost section of the building. The two statues on either side of the steps of the hall are of Kinoshita Iesada and Unsho-in, Kita-no-Mandokoro’s elder brother and his wife. Kaisando Hall is an important cultural property. The outer section of Kaisando is known as Raido worship hall where we prayed for some time. Photography inside the building is not allowed. There is a beautiful pond named Garyochi to the east of Kaisando Hall. I am standing in front of Kaisando Hall. Garyochi Pond is seen on the right side of the photo. Next, we walked on the paved pathway and reached a building named Otamaya located to the east of Kaisando Hall. Otamaya Sanctuary is the mausoleum of Kita-no-Mandokoro. Wooden images of Kita-no-Mandokoro, Toyotomi Hideyoshi, and a Buddhist statue of Daizuigu Bosatsu are enshrined in an altar at the rear of the hall. The altar and the dais upon which it stands are decorated with a special lacquer work technique incorporating designs in gilded gold patterns. This special lacquer work is known as Kodaiji Makie and represents Azuchi-Momoyama Period lacquer artwork. Otamaya is an important cultural property. 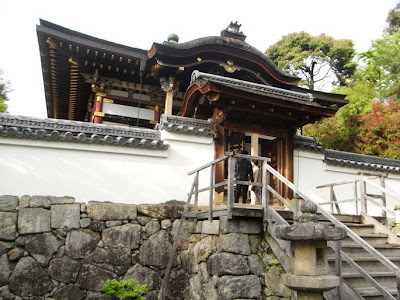 We walked further up the hill on the paved pathway and saw two traditional teahouses named Kasatei and Shiguretei located on the eastern side of the temple precincts. These teahouses are the original 16th century structures and are in an excellent state of preservation. Both the structures are important cultural properties. At this point, we started walking on the return path which passes through a lovely bamboo grove. We reached in front of Chokushimon Gate outside the paid area of the temple premises. We saw several interesting statues and objects of worship located in the southern part of the temple precincts outside the paid area. A small shrine named Temmangu has a statue of Sugawara no Michizane, also known as Temma-Tenjin, enshrined inside. Kita-no-Mandokoro revered this deity. 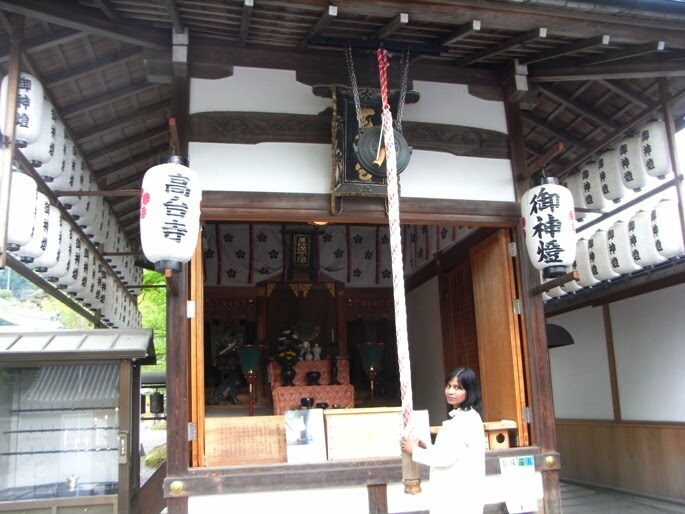 It is believed that if we walk around the shrine three times, our wishes will be granted and misfortunes will fade away. 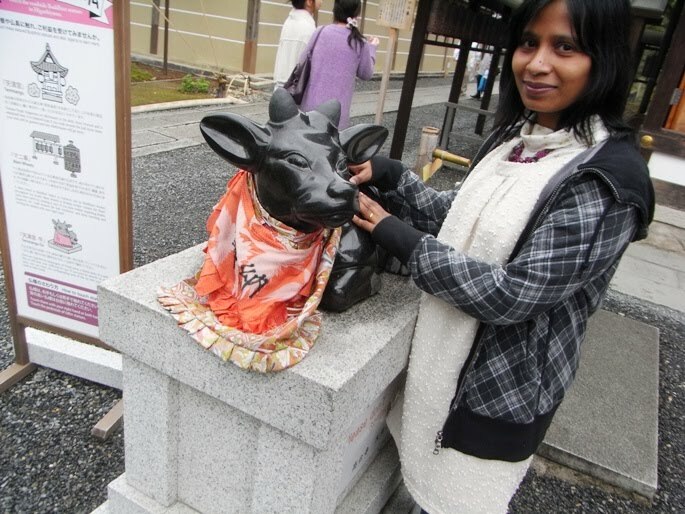 In front of this shrine is a statue of Temmangu ox. Oxen are regarded as messengers of Tenjin deity. It is said that this ox will bear our sufferings for us. If we have an ailment on our body, we can touch the corresponding area of the ox with our right hand or both hands. To the southwest, adjacent to Temmangu Shrine, we saw cute statues of Toyotomi Hideyoshi and Kita-no-Mandokoro. Touching these two statues is supposed to bring peace and happiness to married couples. To the northwest, adjacent to Temmangu Shrine, several prayer wheels called Mani wheels stand in a row. A prayer wheel is a hollow cylindrical wheel on a spindle with Buddhist sutra written on it. 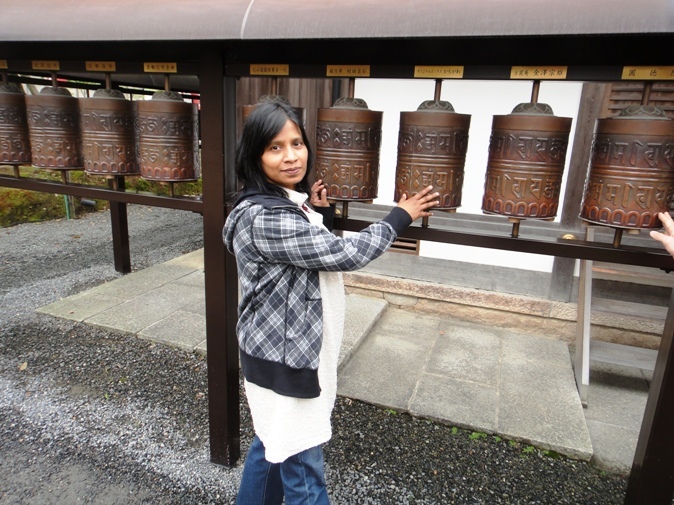 The prayers wheels at Kodaiji Temple contain Heart Sutra. We can turn these wheels with our right hand and wish for health and longevity. The Japanese characters for writing Mani wheels can be pronounced as ‘Manikuruma’ or ‘Manisha’. Hubby took several photos of me standing next to the prayer wheels as he was very amused to see ‘Manisha standing next to Manisha’. 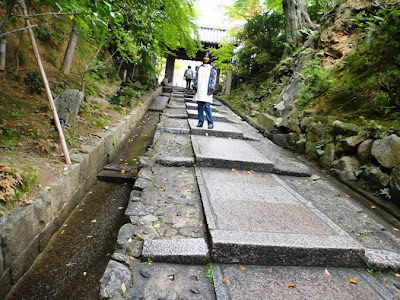 Next, we walked towards the southwest corner of the temple precincts on the hill top. Here we saw a bell tower named Shoro. Kinoshita Iesada donated the original bell to the temple in 1606. The bell used to be inside Shoro until December 2010, when it was retired due to progressive fatigue. 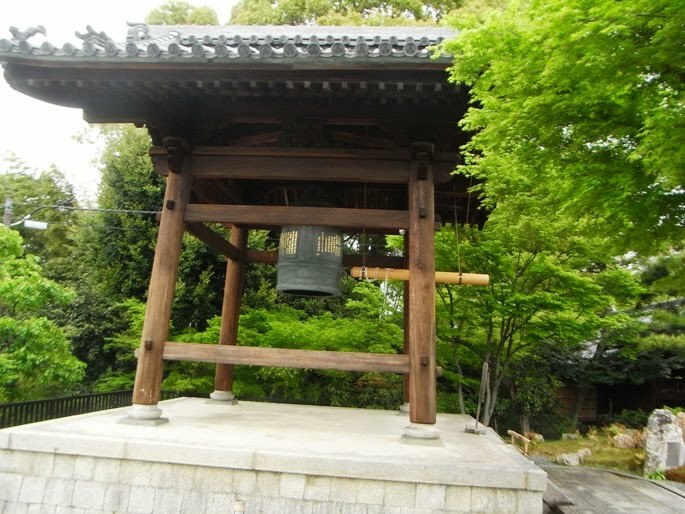 The original bell is an important cultural property and has served the people of Kyoto for 400 years. The new bell measuring 2 meters high and 1.1 meters in diameter was installed just six months ago. From the hill top, we got a beautiful view of Kyoto city. 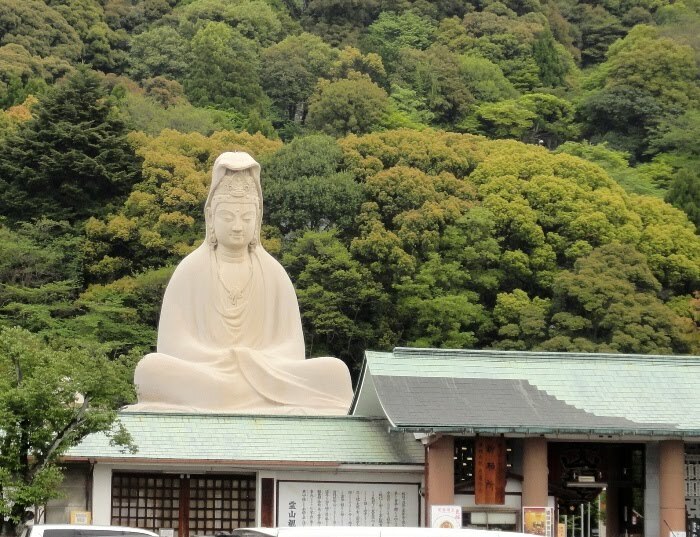 To the southeast corner of the temple precincts, we saw a huge statue of Buddha named Ryozen Kannon. It is a concrete and steel statue of white robed Kannon which is 24 meters high. It is a war memorial to commemorate the Japanese who died during World War II. We could not enter inside the memorial as it was 6 pm and already closed for the day. We loved visiting Kodaiji Temple. 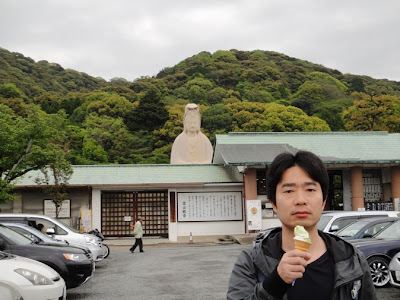 The next morning we visited Toyokuni Shrine and Toyotomi Hideyoshi’s mausoleum about which I will write in the next post. 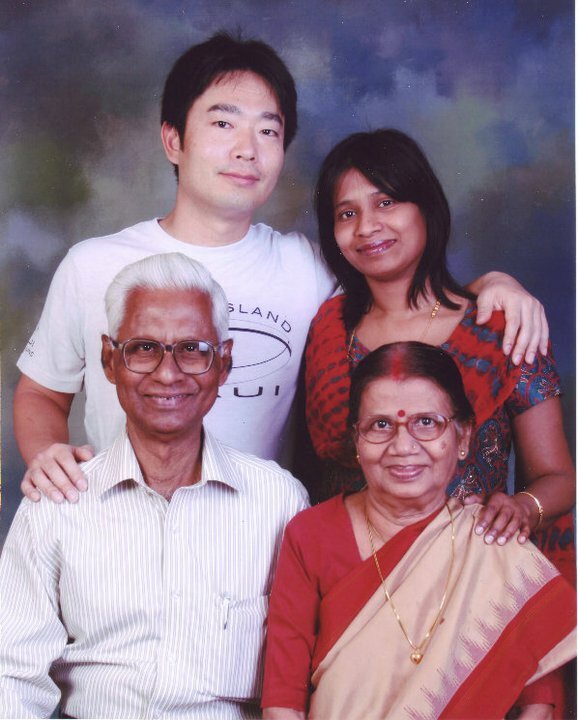 Just ran across your wonderful blog when I was doing a Google search for Inakadate Tanbo Art. I have been living in Japan for 2 years and am always trying to learn more about my surroundings and future spots to visit. I'll be following your blog on my feed reader and will also read your past entries. enjoyed visiting the temple through your photographs :) Temmangu Ox is so similar to our nandi (of Hindu culture). The roads also seem to be similar to the one's in smaller Indian cities. Thanks for the comment Kristina. 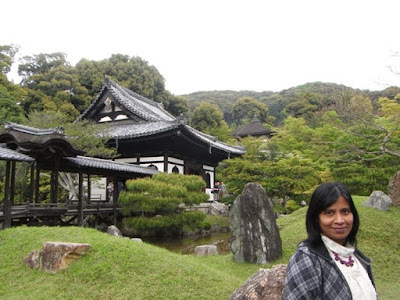 Hope you enjoyed visiting various places in Japan through this blog. And thanks for reading the posts and following the blog. Thanks for your comment We Cognize. Buddhism spread to Japan from India, via China and Korea. Therefore many of the concepts of Hinduism are incorporated in Buddhism. There are many Buddhist Gods that have its origin in Hinduism, like Saraswati, Lakshmi, Vishnu, and many more. But the names are very much modified. Temmangu Ox is same as Nandi. 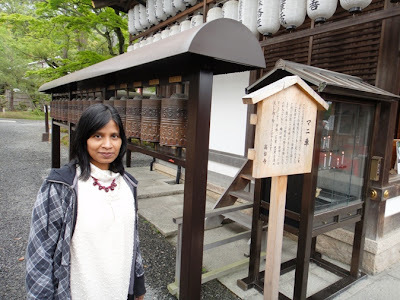 I have just come across your blog on Kodai-ji Temple. 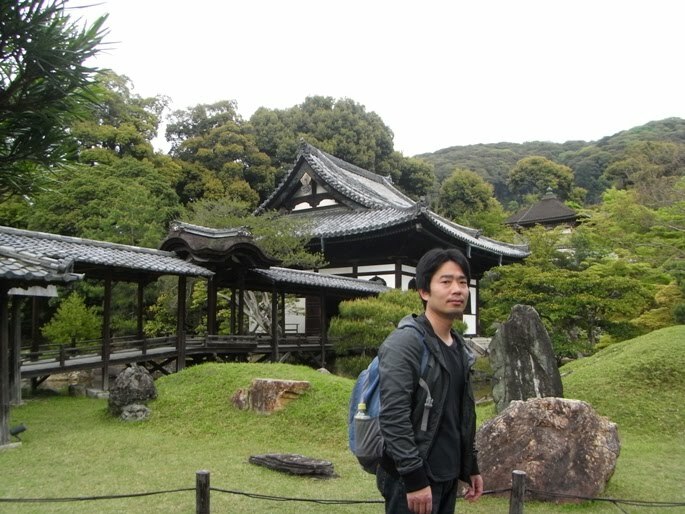 I visited there last Autumn in Kyoto. It was an unforgettable experience. 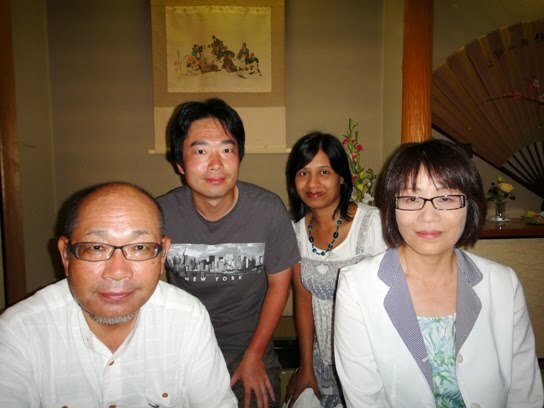 Thanks Akiko for your nice comment. 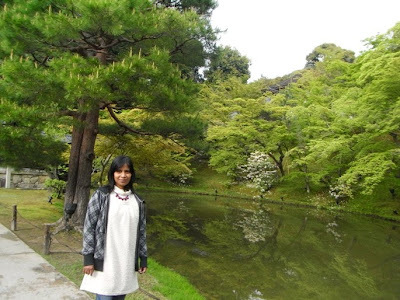 Yeah, the garden of this temple is so beautiful and elegant. 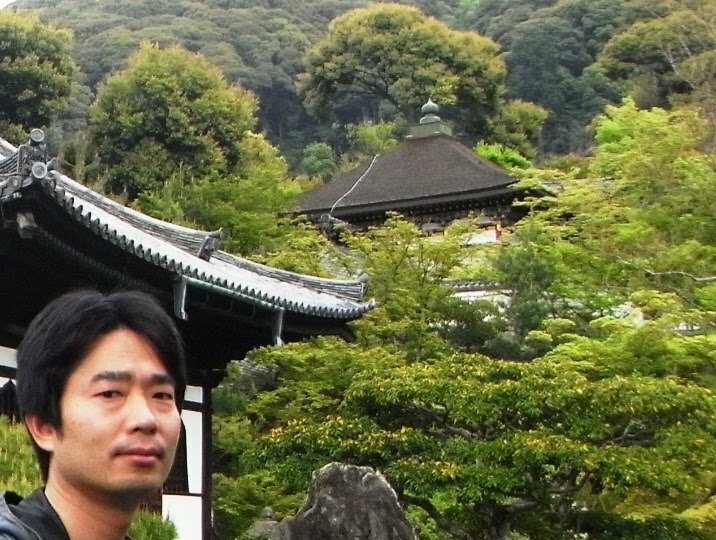 I wish to visit Kyoto again to see all the wonderful architectures of the temples and shrines.